DO NOT BE AFRAID is what I call “the Passion of the Nativity”, which might sound a bit odd at first. It tells the story of the Nativity, though, as with PASSION PLAY (aka THE KING MUST DIE) the setting is modernised – the baby is born in a motel garage, for example, and sleeps in a cardboard box, rather than in a manger. However, the central character is Herod rather than Mary and Joseph, and the play emphasises the setting in a dictatorship, under the rule of a violent and unpredictable ruler. The starting point for my writing was the story of the Massacre of the Innocents. It seldom gets much of a look-in in traditional nativity plays, though it is the subject of one of the plays in the medieval mystery play cycles. I have long thought that, if there is any truth in the nativity story, the massacre of the children must have had a ghastly impact. What was the king thinking? What did the men who carried it out think? So, the massacre is the climax of the play and provides its overall rationale. On their way to Bethlehem, Mary and Joseph fall in with another couple who, as it turns out, are not so fortunate as to escape the King’s terrible wrath. Just as I give the last word in PASSION PLAY to Thomas and his demands for proof, so DO NOT BE AFRAID gives the last word to Jonathan, the father who has just lost his new-born son and his wife to Herod’s murderers. There is no easy happy ending here – Jonathan is angry and bitter and soothing words from Mary do nothing to assuage his feelings. It’s a reminder that the Christmas story is not, in fact, the cosy story we have made it, but a harsh one of suffering and death. But one phrase keeps coming up in the biblical original, “Do Not Be Afraid” – the angels say it to the shepherds, Gabriel says it to Mary when he tells her of her impending child and again to Joseph, telling him to take Mary to him. The phrase always puzzled me – in the traditional telling, there is nothing particularly for anyone to be afraid of. DO NOT BE AFRAID shows that, in fact, there was a good deal to be afraid of – very afraid. 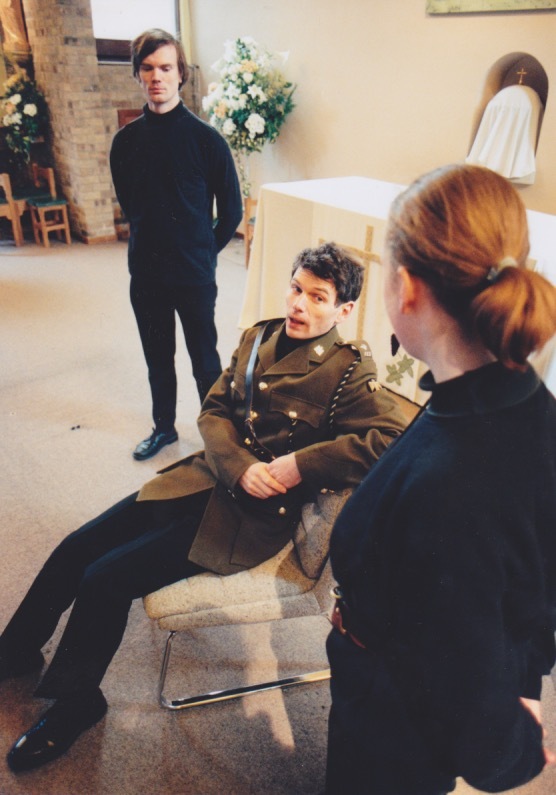 DO NOT BE AFRAID was first performed at St Laurence’s Church, Cambridge, in 1997. In 2000 it was adapted for radio by James Lark and broadcast in three episodes on BBC Radio Cambridgeshire. ASHER: Won’t you tell me what’s going on? ASHER: Am I under arrest? TOBIAS: Thank you, gentlemen. I think I know the procedure from now on. ASHER: They got you too? What’s going on? TOBIAS: I confess I don’t know, but I am impatient to find out. I always enjoy visits to the palace when I am privileged enough to receive an invitation from his Majesty. I don’t know about you, Asher, but I consider myself always at his Majesty’s disposal, at all times of the day and night. ASHER: (Understanding) No. No, of course not. I am always delighted to be available for the King. TOBIAS: (He finds the bug and muffles it with his scarf) Of course. So are we all. I am quite looking forward to this. I like surprises. (Dropping his voice) Right. Keep your voice down. It’s only muffled and there’s probably a camera hidden somewhere as well. What happened? ASHER: I was in bed. They gave me five minutes to dress. What about you? TOBIAS: Much the same, old boy. Except I always have a set of clothes packed, just in case. ASHER: Is there any way out? TOBIAS: This is it. Sorry. ASHER: But I haven’t done anything. TOBIAS: That doesn’t matter. You know that. TOBIAS: Don’t catch their eye. Look down or straight ahead. Don’t give them any excuse. ASHER: Any excuse for what? TOBIAS: Well, well. How are the mighty fallen. TOBIAS: Oh, Simeon. Did he catch you pinching the spoons? SIMEON: Can’t you be serious? TOBIAS: All right. What’s going on? ASHER: Is it a coup? TOBIAS: It looks like it. You’ve heard of a palace revolution; now you’re in one. Well, Simeon, you were the one who saw him last. What did you say to him? SIMEON: I didn’t say anything. SIMEON: All right. He’s worried. Nathan’s been scaring the pants off him with some mumbo jumbo. You know the sort of thing. Jupiter in the ascendant with Taurus taking a nosedive. Why the hell does he have to take it so seriously? TOBIAS: Because he’s scared stiff, of course. Why does he have so many people shot? Or did it never occur to you to ask? TOBIAS: Keep calm. Whatever you do, keep clam. And look down. ASHER: What will they do? TOBIAS: I’m sure Simeon can tell you in great detail. SIMEON: Oh, for God’s sake, Tobias. ASHER: Tobias, if we don’t get out of this, I want to thank you. For everything. TOBIAS: All right. (To SIMEON) Shake? Come on, Simeon: they’re about to attach electrodes to your balls. Shake hands, man. GUARD: Up. All of you. HEROD: Right. Who shall it be? HEROD: Bang! No, don’t move. Don’t any of you move. I can’t remember if it’s loaded. Very dangerous. Don’t want any accidents. I want to hit the right one. No, little Asher, not you. What about Tobias? Big, solid, dependable Tobias. Never gives away what he’s thinking. Could be thinking anything. Or shall it be Simeon? Simeon the Police Chief. They’re all scared of Simeon, but not as scared as he is now. Do take care, Simeon: that floor’s freshly washed. HEROD: Now don’t spoil it. I don’t want a scene. I just want – (He pulls the trigger. The gun is not loaded.) Take them off. The blindfolds – take them off. (They do.) It’s funny, though. I could have sworn it was loaded. Don’t you think that’s funny? Well, thank you. HEROD: For coming. I’m so sorry about the late hour. I do appreciate it, really. TOBIAS: We are glad to be of service, Majesty. HEROD: Now, now, Tobias. What you mean, I’ve got a bloody nerve hauling you all the way up here in the middle of the night. What’s the time? Three? Four? GUARD: Quarter past three, sir. HEROD: Simeon, that’s your favourite time, isn’t it? Isn’t that when you send your men out calling? Just when everyone thinks it’s safe and has gone to bed. Tut tut, Simeon, it’s really not very nice, you know. Still, now you know what it’s like. Tobias, you garden, don’t you? HEROD: You like plants, don’t you? TOBIAS: Yes, Majesty. I dabble. HEROD: (Imitating him) I dabble. Well, even you might appreciate this. Gather round. Come on, Simeon: you too. HEROD: I had it shipped over specially. Look! Isn’t she magnificent? HEROD: Look at those colours. Absolutely beautiful. Quite, quite lovely. I’ve been trying to think up a name for her. She’s got some Latin name, of course, but I want her to have a new name. A Herodian rose. Or perhaps Herod the Great. What do you think, Asher? ASHER: They’re very fine names, Majesty. HEROD: You’re not very experienced at this game, are you, Asher? Does you good. Does you all good. Gives you a taste of what it’s been like for those poor sods out there. Shipped from one end of the country to the other, no idea where they’re going, not knowing what to believe about it all. Am I right, Tobias? Were my people scared? TOBIAS: I believe there was a certain level of apprehension, Majesty. HEROD: They thought I was going to kill them all, didn’t they? How could they think that of me? Eh, Simeon? SIMEON: I can’t imagine, Majesty. HEROD: Oh him. They’re all terrified of him. You know, I think they hate Simeon more than they hate me. ASHER: Surely no-one hates your Majesty? HEROD: Tobias, you’ll have to train him more. There’s a time for flattery, Asher, and a time for speaking openly. Just at the moment we’re speaking openly. When I want some flattery I’ll nod my head. My head. I get such headaches. Do you get headaches, Asher? ASHER: No, Majesty, not really. HEROD: It doesn’t seem right that I should get them and not you. TOBIAS: You have so much more to think about, Majesty. HEROD: Oh, he’s good, Asher. Tobias is very good. He judges it just right. Study his style, Asher: you won’t go far wrong. HEROD: You do that, Asher. You’re young, you’re bright. You’ve come a long way already. Do you like your work? HEROD: You keep an eye on the foreign press for me, don’t you? HEROD: It’s very important to me, you know. I mind what they say about me. I mind a lot. HEROD: Good. And you keep an eye open for any wicked stories that don’t treat me with proper respect? HEROD: I know you do, Asher. I know you do. I know you do. I know you do. You’re good at your job, aren’t you, Asher? Tobias thinks the world of you. Isn’t that right, Asher? ASHER: Majesty, you’re hurting me. HEROD: (Slaps ASHER’s face) Hurting you? There’s a story, Asher. A story in all the papers. You know what it says? Of course you do, Asher: you’re good at your job. There are three foreigners, aren’t there, Asher? They’re talking about me, aren’t they, Asher? What are they saying, these foreigners? HEROD: What are they saying, little Asher? HEROD: A prophesy? A prophesy about me? ASHER: Not really about you, Majesty. HEROD: Not about me? There’s to be a new King. Here in Judaea. That’s what they’re saying, isn’t it, Asher? HEROD: I know what they said. Nathan told me. Where was your report, Asher? I thought to myself, “My little friend Asher will be here soon with a great fat file about these naughty, naughty men and their silly prophesy. He’ll come and tell me all about it”. That’s what I thought. And I waited. I waited. I waited. I waited. ASHER: Majesty, we have a file. ASHER: I have worked on nothing else. I’ve got all the details. I know all about them. And there’s nothing to worry about. ASHER: I thought you’d prefer the full report. When it was ready. ASHER: There’s nothing to worry about, Majesty. We’ve looked into them. They’re cranks. Astrologers. Star-gazers. It’s all based on stars and numbers and mumbo jumbo. It’s not serious. There’s nothing to worry about. HEROD: You are very, very silly, Asher. ASHER: Majesty, it’s true. They’re harmless. There is no plot against you. GUARD: (To ASHER) When you’re ready, sir. GUARD: Mind the step, sir. That’s it. HEROD: You’ll have to train them better, Tobias. Simeon, what do you take for headaches? SIMEON: How seriously do you take this story, Majesty? HEROD: I suggest you ask the late Mr Asher. I thought you had a file on them, anyway? SIMEON: We have, Majesty. It’s awkward, of course, because they are foreign nationals living abroad. In addition, Rome lapped it all up. All of which means we can’t touch them. Yet. HEROD: My head! My head! It’s like a drumming. It gets louder and louder and it won’t stop. (All pause. HEROD clutches his head and motions them to silence. He recovers and turns to SIMEON.) Go on. These men. SIMEON: Why not invite them here? SIMEON: It gives you a degree of control over the story. HEROD: Find out more of what they’re saying, you mean? It’s possible. TOBIAS: What exactly are they saying? SIMEON: A new king. Due to arise in or around Jerusalem any day now. HEROD: And they’re each of them saying it. Independently. That’s what’s so worrying. TOBIAS: They could be colluding. HEROD: The point is, they’re all saying it, and soon everyone in the country will know it. Why does my head ache so much? SIMEON: With respect, Majesty, people will know what we want them to know. HEROD: All right. Invite them here. Pamper them. Find out all you can. We’ll talk again. My head. Where’s my doctor. Bring my doctor. Guards! HEROD: I’m going to bed. Bring my doctor. TOBIAS: Good night, Majesty. I hope you are soon recovered. HEROD: Bugger off, Simeon. Bugger off, both of you. SIMEON: Well, are you coming or aren’t you? SIMEON: You’re not admiring his bloody dahlia, are you? TOBIAS: I was saying a quick prayer for Asher. SIMEON: A bit late for that. Get the poor sod to say a prayer for us: we’re the ones who are going to need it. JOSEPH: Hello. Did you get everything? MARY: Just about. The market was packed. How’s your day been? JOSEPH: Busy. We’re just clearing up. Would you like something? On the house. JOSPEH: It’s all right. You charmed the boss so much he won’t refuse you anything. You know what these Egyptians are like. MARY: I’ll have an orange juice. And I’ll pay. MARY: Jonathan! I thought it was you. MARY: Mary. We met on the bus down from Nazareth. When we had to register. JONATHAN: I’m sorry. Yes, of course. MARY: I’m so glad you got out. I really hoped you would. Are you in a hurry? MARY: Come and sit down. Joseph’s here. He’s got a job as a waiter. JONATHAN: When did you get out? MARY: Just in time. We barely made it across the border before it all started. JONATHAN: That was lucky for you. MARY: Joseph, you remember Jonathan? JOSEPH: Of course. Good to see you. You got out, then? JONATHAN: Yes, I got out. MARY: Oh no. Oh, Jonathan, I’m so sorry. What happened? JONATHAN: I don’t really know. They fished her out of the river. JONATHAN: She may have jumped. She may have fallen. She may have been pushed. It doesn’t really matter, does it? She’s dead, either way. MARY: Had she had the baby? JONATHAN: Oh yes, she’d had it. A little boy. Simon. They came in the middle of the night. Apparently we were staying in the first area they hit. Typical of our luck, really. JONATHAN: Don’t. It won’t bring them back. You got out; that’s something. And your little one. What’s his name? JONATHAN: Well, this calls for a drink. What will you have? MARY: I’m all right, thank you. JONATHAN: No, I insist. At least someone managed to get out. There is hope after all. What will you have? Cocktail? MARY: It’s a bit early. JONATHAN: Nonsense. Never too early. Never too early for a celebration. Come on, Joseph, bring us a big bottle of your finest champagne so we can toast your little one. The biggest bottle you’ve got. What are they called? Jeremiahs? JONATHAN: That’s the ticket. A Jeroboam of champagne. So we can toast your little one and remember mine. Here’s to the children! Here’s to our hope for the future! Here’s to the little ones and confusion to all those who would – I’m sorry. JOSEPH: Look, Jonathan, where are you staying? JOSEPH: Why don’t you come round this evening? Come and have dinner with us. I’ll give you the address. JONATHAN: No. No, thank you. I’d rather not. JOSEPH: There’s a sort of group of us who meet each week. We’ve got the use of a school hall in the evenings. There’s a committee who can help find you somewhere to live, help get you a job. That’s how I got this job. We’ve got to stick together, Jonathan. All of us. It’s the only way. JONATHAN: The only way to what? JONATHAN: But they didn’t survive. It’s too late. MARY: No, Jonathan, it’s not too late. It’s never too late. JONATHAN: Never too late for what? MARY: Never too late for hope. Never late to overcome. Never too late to win through. JONATHAN: Please, Mary, please don’t start getting religious. Because I’ve had it up to here. I’ve had people telling me this is God’s way of testing me. I’ve had people telling me that God allows these things so that good can come from them. I’ve had people telling me it’s God’s judgement, or it’s all part of a cosmic battle of good and evil, or else it’s the unfathomable problem of pain, which no-one understands. I even had one person telling me it was my fault. But all in the nicest possible way, of course. I’ve had people throwing their arms around me and I’ve had people saying prayers for me. I’ve had candles lit and nice little thoughts on scraps of paper, with soft focus photographs of flowers and sunsets. I’ve been taken along to prayer groups and prayer meetings and I’ve had more books and pamphlets pushed under my nose than I can count. And you know what? It doesn’t help. But I’ll tell you this, Mary. If this is part of God’s plan for me or for the world, then all I can say is that I don’t think much of it. And I don’t think much of him. MARY: I wasn’t going to get religious. Not in the sense you mean. I don’t know why this has happened any more than you do and if you ask me why God allowed it, I don’t know. I wish he hadn’t. JONATHAN: Yes, so do I.
JONATHAN: In Father Christmas and in fairies and in leylines and crop circles. Well, bully for you, Mary, but it doesn’t help me. MARY: But why not? What’s so difficult? JONATHAN: Faith is difficult. Why can you people never see that? Trying to have faith – any faith – is the hardest thing on earth. Especially now. It’s all right for God, up there in heaven. Life must be very easy when you’re omnipotent, all-seeing, all-knowing, all singing and dancing too, I suppose. Well, I’m sorry I’m so ordinary. I can’t perform miracles or create the world; all I can do is try to lead a decent life with my family in this wretched world of his. If that’s so easy, why doesn’t he try? Nothing dramatic: just try looking after a wife and two children. Then let him go through what I’ve just gone through. And no special powers to whizz away at the first sign of trouble, either. Then possibly, just possibly, I might be inclined to listen to him. MARY: And if he did that? JONATHAN: Some chance, Mary, some chance. Look, I’m sorry, I’m not at my best. I didn’t mean to hurt your feelings. I’ll go. JONATHAN: Don’t get me wrong, but I’d rather go. JOSEPH: Here’s our address. Will you come tonight? About eight? JONATHAN: I don’t know. Perhaps. JOSEPH: We’ll wait for you. MARY: Do you think he’ll come? MARY: No, neither do I.
MARY: (To JESUS) Well, this is how you wanted it, isn’t it?